Algeria with its capital Algiers is located in Africa (Northern Africa, bordering the Mediterranean Sea). It covers some 2,381,741 square kilometers (slightly less than 3.5 times the size of Texas) with 40,969,400 citizens. Arabic is the language commonly spoken used in Algeria. Libya, Mali, Mauritania, Morocco, Niger, Tunisia and Western Sahara are bordering countries. Algeria is an Arab and Berber country in North Africa. It has a mediterranean sea coastline in the north. Much of recent Algerian history has been dominated by civil wars and subsequent warlordism. That said, the country is gradually restoring order and will prove an interesting - if difficult - destination. The official language is Arabic. Generally, only the young generations in Algeria can understand some English, but most people are able to communicate in French. As in all of North Africa, the dominant religion in Algeria is Islam. Be respectful. If visiting a mosque, for example, be sure to be dressed conservatively and remove your shoes before entering it. The landscape is mostly high plateau and desert with some mountains as well as narrow, discontinuous coastal plain. The average density of population is about 17 per km². The climate in Algeria can be described as arid to semiaridmild, wet winters with hot, dry summers along coast, drier with cold winters and hot summers on high plateau, sirocco being a hot, dust/sand-laden wind especially common in summer. Potential threats by nature are droughts, mountainous areas subject to severe earthquakes and mudslides and floods in rainy season. To reach someone Algeria dial +213 prior to a number. The local cellular networks are operated on 900 MHz, 1800 MHz, 3G, 4G. Websites typically end with the top level domain ".dz". If you want to bring electric appliances (e.g. battery chaarger), keep in min the local 230 V - 50 Hz (plugs: C, F). The sign for the locally used currency Dinar is DZD. 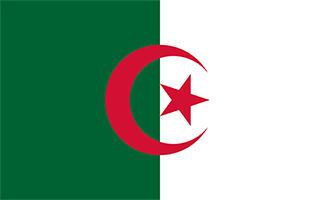 Two equal vertical bands of green (hoist side) and white; a red, 5-pointed star within a red crescent centered over the two-color boundary; the colors represent Islam (green), purity and peace (white), and liberty (red); the crescent and star are also Islamic symbols, but the crescent is more closed than those of other Muslim countries because Algerians believe the long crescent horns bring happiness.